Learn HOW cold water kills--sometimes in as little as a couple of minutes. You may download and use this slide show for non-commercial purposes without charge. Please send us an e-mail to let us know how it was received. published in the February 2006 Edition of Pacific Yachting Magazine. Prior to the 1960s, the popular wisdom was that drowning was the cause of death in cases where people were lost overboard, especially in temperate latitudes. However, in the 1960s and 1970s attention began to shift to hypothermia as a major cause of death in instances of cold water immersion. Since cold water will carry heat away from the body 25 times faster than air of the same temperature, the average body cools rapidly, and within 20 to 30 minutes, depending on water temperature, body core temperature drops to below 35 degrees C (95 degrees F.) An individual's response to cold water will vary from the average depending on a number of factors including clothing, amount of body fat, activity, etc. but the steady decline in core temperature will continue until the person is removed from the water. 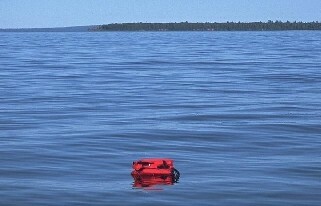 One can extend survival time by simply elevating a portion of the body out of the water onto floating wreckage. Every square inch of body surface removed from the water will incrementally extend the cooling time, even though the air feels cool and a wind may be blowing. Once popular attention was focused on hypothermia, products appeared that would protect a person from the effects of hypothermia, and greatly extend survival times. These thermal protection products fell into three broad categories. These and other technologies have significantly improved the survival odds in ship abandonment situations. In recent years, due to the pioneering work of Drs. Michael Tipton and Frank Golden (UK) and in Canada, Dr. Chris Brooks, it has become clear that hypothermia may not be the major cause of death in cold water immersion situations. It appears that up to 60% of the fatalities due to cold water immersion occur in the first 15 minutes (up to 75% in Alaska), long before the body core cools to hypothermic levels. 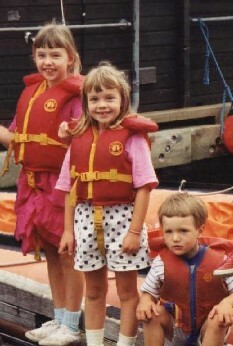 In Canada, between 1991 and 2000, 41% of those who were boating and drowned were within 10 meters of shore. An additional 22% were within 10 to 15 meters of shore. Coroners and pathologists are only now becoming aware of these mechanisms for drowning in cold water. Until recently, most deaths were attributed to hypothermia simply because victims' bodies were wet and cold. Now we now that there are signs which will indicate whether the victim died from drowning due to cold water shock or from hypothermia. The lesson is really very simple. It is not enough to carry a Personal Flotation Device (PFD) on your boat. Once in the water you may not be able to swim the two or three meters necessary to find it. And once you have reached it, you may not have the dexterity to put it on. The only effective prevention is to wear a PFD or lifejacket at all times there is a risk of falling overboard or being ejected from a small boat. Once you have entered the water it is too late--the physiological and neurological responses of your body to the sudden cold may make it impossible for you to keep your airway above water, and you may drown. Cold Water Boot Camp "Most of the water in Canada is cold year round. It’s cold water that is a major contributor to recreational drowning deaths year after year. Nine Boot Camp volunteers offered to ‘jump in with both feet’ and experience first hand what happens in 6 degree Celsius water." The Essentials of Sea Survival by Frank Golden and Michael Tipton. If you only read one nautical book in your life, this should be the one. This book will help you to prepare to survive an accident at sea. 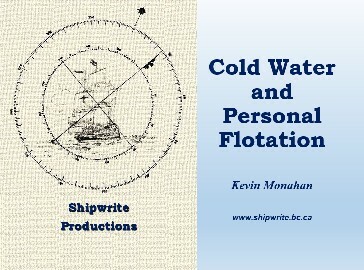 It explains, in very clear language, why hypothermia is not the cold water sailor's greatest challenge. In fact this book explains how your biggest challenge is to survive long enough to risk dying of hypothermia. A must read!! Transport Canada Publication "Survival in Cold Waters" (TP13822) By Dr Chris Brooks. 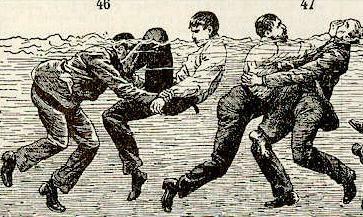 At one time, experts believed that drowning victims would try to drag rescuers down with them. Training for rescuers included techniques for towing a victim at arms length, and for fighting off a panicking drowning victim. 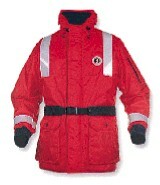 These suits were designed to keep the wearer dry with watertight face and wrist seals. The boots are integral with the suit. Made of neoprene rubber and other impervious materials, these suits provided both flotation and insulation, and immediately began to save lives. It wasn't very long before they became mandatory in a number of marine industries such as the British Columbia fishing industry. Modern survival suits are rugged, easy to don, and will extend survival time to an extraordinary degree if they are put on when one is dry. These coveralls are designed to be worn while working . They provide protection from cold air temperature, and when immersed, provide insulation and flotation. However, they are not watertight and will fill with water in a relatively short time. This water is warmed by the body core and is retained within the suit, providing significant insulation value, and thus extending survival time. These floatation devices are designed to assist in retaining body heat through thermal protection of the body’s high heat loss areas (head, neck, armpits, sides of chest and groin). This type of coat provides insulation and flotation. Some have a "beavertail"--a neoprene rubber flap that can be pulled down from the back of the jacket, under the crotch, and secures to the front of the jacket. When immersed, one deploys the beavertail and secures it to the front of the coat. This provides a surprisingly effective barrier to the movement of water in and out of the coat, effectively trapping a layer of warm water against the body. However, the high-heat loss areas of the upper thighs are still exposed to the cooling effects of the water. Though a Personal Flotation Device has little insulation value, it will help you keep your airway above water and prevent drowning. Drowning due to sudden cold water immersion is the most common cause of death for recreational boaters in Canada.